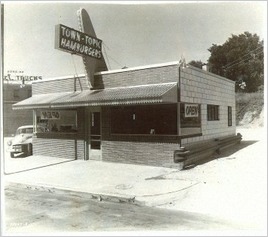 ﻿ History | Town Topic Hamburgers - Kansas City | grilled onions, fresh breakfast, pie! Well, it’s more than 75 years later and Town Topic is still selling hamburgers by the bagful. We still cook them the same way with grilled onions and a steamed bun. We also have the same full breakfast line we have always had, all cooked fresh to order. In fact, the downtown diners haven’t changed a whole lot since the early days. 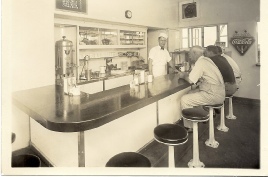 Stop in sometime and take your place at the historic counter. Have an old-fashioned hamburger & hand-dipped malt, steamy homemade chili, fresh breakfast, a piece of pie & coffee or an ice cold Coca-Cola all prepared right in front of you. There are many regular customers who have frequented the establishments for years and they all have great old stories to tell about this wonderful city we call home-just ask them. 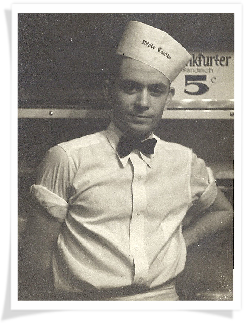 unceremoniously on 24th and Broadway and began selling hamburgers for 5 cents each. It’s name was Town Topic Hamburgers. 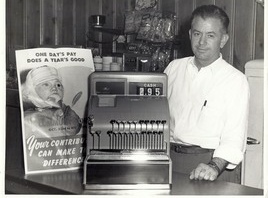 It was opened by Claude Sparks who at he end of his first day pocketed a whopping $21.00. Vanished over the Pacific Ocean.